New School for Social Research, M.A. Jody Hoffer Gittell is Professor of Management at Brandeis University's Heller School for Social Policy and Management, Executive Director of the Relational Coordination Research Collaborative, and Chief Scientific Officer of Relational Coordination Analytics, Inc.
Gittell has developed a theory of relational coordination, proposing that highly interdependent work is most effectively coordinated by frontline workers with each other, their customers and their leaders, through relationships of shared goals, shared knowledge and mutual respect, supported by frequent, timely, accurate, problem-solving communication. The theory has two central propositions: 1) relational coordination drives quality and efficiency performance along with client and worker well-being, under conditions of interdependence, uncertainty and time constraints; and 2) organizational structures support or undermine relational coordination and its associated performance outcomes, depending upon their design. 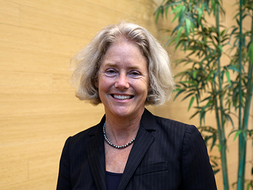 More recently, Gittell's relational model of organizational change has extended the theory to address how organizations and their stakeholders increase relational coordination to achieve their desired outcomes, proposing three types of interventions needed to do so - relational and work process interventions, as well as structural interventions. In The Southwest Airlines Way: Using the Power of Relationships to Achieve High Performance (McGraw-Hill), and in High Performance Healthcare: Using the Power of Relationships to Achieve Quality, Efficiency and Resilience (McGraw-Hill), Gittell describes how relational coordination drives performance in airlines and in healthcare, and how organizations support - or undermine - its development. Up In the Air: How the Airlines Can Improve Performance by Engaging Their Employees (Cornell University Press), co-authored with Bamber, Kochan and von Nordenflycht, analyzes the transformation of the global airline industry in response to low cost competition. Sociology of Organizations: Structures and Relationships (Sage Publications), co-authored with Godwyn, brings together classic and new authors to show how structures and relationships enable organizations to address their most basic challenges. Most recently, Transforming Relationships for High Performance: The Power of Relational Coordination (Stanford University Press) shows how relational, structural and work process interventions enable sustainable systemic change. Going forward Gittell will explore the relational dynamics of multi-level systems change in complex systems such as healthcare, community health and wellness, and public education. Gittell has published in journals such as Academy of Management Review, Human Resource Management, Human Resource Management Journal, International Journal of Human Resource Management, Industrial and Labor Relations Review, Organization Science, Management Science, Journal of Applied Behavioral Science, Journal of Organizational Behavior, Journal of Service Research, Journal of Management Studies, Harvard Business Review, California Management Review, Medical Care, Health Services Research, Health Care Management Review, Journal of Nursing Management, Journal of Interprofessional Care, Negotiation Journal, and Journal of Air Transport Management. Gittell, Jody Hoffer and Lauren Hajjar. "Implementing Patient-Centered Care: How the Relational Model of Organizational Change Can Help." Journal of General Internal Medicine (2019). Gittell, J.H., Logan, C.K., Cronenwett, J., Foster, T., Freeman, R., Godfrey, M. and Vidal, D.C.. "Impact of Relational Coordination on Staff and Patient Outcomes in Outpatient Surgical Clinics." Health Care Management Review (2018). Havens, D.S., Gittell, J.H. and Vasey, J.. "Impact of Relational Coordination on Nurse Outcomes: Achieving the Quadruple Aim." Journal of Nursing Administration 48. 3 (2018): 132-140. Heaphy, E.D., Byron, K., Ballinger, G.A., Gittell, J.H., Leana, C. & Sluss, D.M.. "Introduction to Special Topic Forum: The Changing Nature of Work Relationships." Academy of Management Review 43. 4 (2018): 558-569. Perloff, Jennifer, Rushforth, Alice, Daudelin, Denise, Suchman, Anthony, Gittell, Jody Hoffer, Santos, Hannah, Beswick, Joanne, Moore, Saleema, Selker, Henry. "Intervening to Enhance Collaboration in Translational Research: A Relational Coordination Approach." Journal of Clinical and Translational Science (2017). Gittell, Jody Hoffer and Jacob Storch. "Building a Relational Public Sector." Stanford Social Innovations Review (2016). Gittell, Jody Hoffer and Janet Boguslaw. "Relational Coproduction and Relational Welfare: Asset Based Approaches to Social Well-Being." Kognition and Paedagogic 26. 2 (2016). Gittell, Jody Hoffer. "How Interdependent Parties Build Relational Coordination to Achieve Their Desired Outcomes." Negotiation Journal 31. 4 (2016): 387-392. Gittell, Jody Hoffer. "Rethinking Autonomy: Relationships as a Source of Resilience in a Changing Health Care System." Health Services Research 51. 5 (2016). Gittell, Jody Hoffer. Transforming Relationships for High Performance: The Power of Relational Coordination. Palo Alto, CA: Stanford University Press, 2016. Rubinstein, Saul A., Martin-Rios, Carlos, Erhardt, Niclas, Gittell, Jody Hoffer, George, Varghese. "Organizational Responses to Uncertainty in the Airline Industry: Changes in Patterns of Communication Networks." Journal of Air Transport Management 57. (2016): 217-227. Gittell, Jody Hoffer, Beswick, Joanne, Goldmann, Don, Wallack, Stanley. "Teamwork Methodologies for Accountable Care: Relational Coordination and TeamSTEPPS." Health Care Management Review 40. 2 (2014). Gittell, Jody Hoffer, Godfrey, Marjorie, Thistlethwaite, Jill. "Interprofessional Collaborative Practice and Relational Coordination: Improving Healthcare Through Relationships." Journal of Interprofessional Care 27. 3 (2013): 210-213. Douglass, Anne and Gittell, Jody Hoffer. "Transforming Professionalism: Relational Bureaucracy and Parent-Teacher Partnerships in Child Care Settings." Journal of Early Childhood Research (2012). Gittell, Jody Hoffer and Douglass, Anne. "Relational Bureaucracy: Structuring Reciprocal Relationships Into Roles." Academy of Management Review 37. 4 (2012). Gittell, Jody Hoffer, Patrick Flood and Yseult Freeney. "Relational Coordination." Encyclopedia of Management: Organizational Behavior. 2012. Godwyn, Mary and Gittell, Jody Hoffer. Sociology of Organizations: Structures and Relationships. Thousand Oaks: SAGE Publications, 2011. Bamber, Greg, Gittell, Jody Hoffer, Kochan, Thomas A. and von Nordenflycht, Andrew. "Contrasting Employment Relations Strategies in European Airlines." Journal of Industrial Relations 51. 5 (2010): 635-652. Bond, Brenda and Gittell, Jody Hoffer. "Cross-Agency Coordination of Offender Reentry: Testing Outcomes of Collaboration Policies." Journal of Criminal Justice (2010). Gittell, Jody Hoffer and Bamber, Greg. "High and Low Road Strategies for Competing on Costs and Their Implications for Employment Relations: Studies in the Airline Industry." International Journal of Human Resource Management 21. 2 (2010): 165-179. Gittell, Jody Hoffer, Seidner, Rob, Wimbush, Julian. "A Relational Model of How High-Performance Work Systems Work." Organization Science 21. 2 (2010): 490-506. Sullivan, Donna Havens, Vasey, Joseph, Gittell, Jody Hoffer and Lin, Wei Ting. "Relational Coordination among Nurses and other Disciplines: Impact on the Quality of Patient Care." Journal of Nursing Management (2010). Bamber, Greg, Gittell, Jody Hoffer, Kochan, Thomas A., von Nordenflycht, Andrew. Up in the Air: How the Airlines Can Improve Performance by Engaging Their Employees. Ithaca, NY: Cornell University Press, 2009. Carmeli, Abraham and Gittell, Jody Hoffer. "High Quality Relationships, Psychological Safety and Learning from Failures in Work Organizations." Journal of Organizational Behavior 30. 6 (2009): 709-729. Gittell, Jody Hoffer. "Lack of Coordination Hampers U.S. Healthcare System." Modern Healthcare August 20. Gittell, Jody Hoffer. High Performance Healthcare: Using the Power of Relationships to Achieve Quality, Efficiency and Resilience. New York: McGraw-Hill, 2009. Gittell, Jody Hoffer, Weinberg, Dana Beth, Pfefferle, Susan, Bishop, Christine. "Impact of Relational Coordination on Job Satisfaction and Quality Outcomes: A Study of Nursing Homes." Human Resource Management Journal 18. 2 (2008): 154-170. Gittell, Jody Hoffer. "Relationships and Resilience: Care Provider Responses to Pressures from Managed Care." Journal of Applied Behavioral Science 44. 1 (2008): 25-47. Gittell, Jody Hoffer; Weinberg, Dana, Bennett, Adrienne and Miller, Joseph A.. "Is the Doctor In? A Relational Approach to Job Design and the Coordination of Work." Human Resource Management 47. 4 (2008): 729-756. Kautz, Cori, Gittell, Jody Hoffer, Lusenhop, Will, Weinberg, Dana Beth, Wright, John. "Patient Benefits from Participating in an Integrated Delivery System: Impact on Coordination of Care." Health Care Management Review 32. 3 (2007): 1-11. Weinberg, Dana, Gittell, Jody Hoffer, Lusenhop, Will, Kautz, Cori, Wright, John. "Beyond Our Walls: Impact of Patient and Provider Coordination Across the Continuum on Outcomes for Surgical Patients." Health Services Research 42. 1 (2007): 7-24. Weinberg, Dana, Lusenhop, Will, Gittell, Jody Hoffer, Kautz, Cori. "Coordination between Formal Care Providers and Informal Caregivers." Health Care Management Review 32(2). 140-150 (2007). Gittell, Jody Hoffer, Briscoe, Forrest. "Layoffs and Organizational Resilience: Lessons for Workers, Managers and Investors." Perspectives on Work 10. 1 (2006): 6-8. Gittell, Jody Hoffer, Cameron, Kim, Lim, Sandy, Rivas, Victor. "Relationships, Layoffs and Organizational Resilience: Airline Industry Responses to September 11." Journal of Applied Behavioral Science 42. 3 (2006): 300-329. Pfefferle, Susan, Gittell, Jody Hoffer, Hodgkin, Dominic, Ritter, Grant. "Pediatrician Coordination of Care for Children with Mental Illnesses." Medical Care 44. 12 (2006): 1085-1091. Gittell, Jody Hoffer and Weiss, Leigh. "Coordination Networks Within and Between Organizations: A Multi-Level Framework." Journal of Management Studies 41. 1 (2004): 127-153. Gittell, Jody Hoffer, von Nordenflycht, Andrew and Kochan, Thomas. "Mutual Gains or Zero Sum? Labor Relations and Firm Performance in the Airline Industry." Industrial and Labor Relations Review 57. 2 (2004): 163-179. Gittell, Jody Hoffer. "The Power of Relationships." Sloan Management Review 45. 2 (2004): 16-17. Perlow, Leslie, Gittell, Jody Hoffer and Katz, Nancy. "Contextualizing Patterns of Work Group Interaction: Toward a Nested Theory of Structuration." Organization Science 15. 5 (2004): 520-536. Gittell,Jody Hoffer. "Options for Rebuilding Labor Relations." Perspectives on Work 7. 2 (2003). Gittell,Jody Hoffer. The Southwest Airlines Way: Using the Power of Relationships to Achieve High Performance. New York: McGraw-Hill, 2003. Gittell,Jody Hoffer. "Coordinating Mechanisms in Care Provider Groups: Relational Coordination as a Mediator and Input Uncertainty as a Moderator of Performance Effects." Management Science 48. 11 (2002): 1408-1426. Gittell,Jody Hoffer. "Relationships between Service Providers and their Impact on Customers." Journal of Service Research 4. 4 (2002): 299-311. Gittell,Jody Hoffer. "Investing in Relationships." Harvard Business Review 79. 6 (2001). Gittell,Jody Hoffer. "Supervisory Span, Relational Coordination, and Flight Departure Performance: A Reassessment of Post-Bureaucracy Theory." Organization Science 12. 4 (2001): 467-482. Gittell,Jody Hoffer, Fairfield, Kathleen, Bierbaum, Benjamin, Head, William, Jackson, Robert, Kelly, Michael, Laskin, Richard, Lipson, Stephen, Siliski, John, Thornhill, Thomas and Zuckerman, Joseph. "Impact of Relational Coordination on Quality of Care, Post-Operative Pain and Functioning, and Length of Stay: A Nine Hospital Study of Surgical Patients." Medical Care 38. 8 (2000): 807-819. Gittell,Jody Hoffer. "Organizing Work to Support Relational Coordination." International Journal of Human Resource Management 11. 3 (2000): 517-539. Gittell,Jody Hoffer. "Paradox of Coordination and Control." California Management Review 42. 3 (2000): 177-183. Gittell,Jody Hoffer with Thomas A. Kochan and Brenda Lautsch. "Total Quality Management and Human Resource Systems: An International Comparison." International Journal of Human Resource Management 6. 2 (1995): 201-222. Gittell,Jody Hoffer. "Cost/Quality Tradeoffs in the Departure Process? Evidence from the Major U.S. Airlines." Transportation Research Record 1480. (1995): 25-36.